German chocolate praline bar, Duplo, poke fun at the Smart Phone revolution in this charming new advert featuring music licensing from Tracks & Fields. 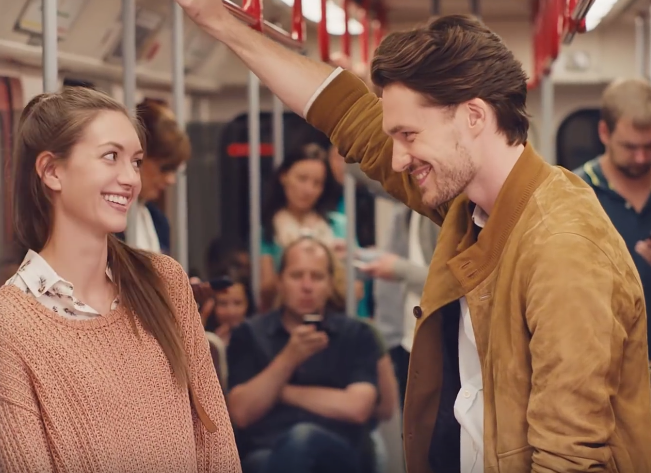 The advert sees two young people astonished to be the only travellers not occupied with a Smart Phone on the subway. While the young, old and even the moustachioed play games, text and take selfies, the two phoneless strangers catch each other’s gaze. Bridging their meet-cute is a Duplo bar, from confectioner Ferrero, which is at first passed off as a mobile phone before being revealed as chocolate. But it’s not just any chocolate bar, in a line that sounds like it should be in an electronics commercial, the voiceover claims Duplo is ‘probably the smartest praline in the world’. And it definitely is a smart alternative, as the advert finishes with smiles and laughter. Keeping up with the light-hearted nature of the advert, Tracks & Fields licensed music from the Canadian singer songwriter Marc Robillard. The upbeat synch of Robillard’s track ‘Time With You’ adds charm to the couple’s subway romance.